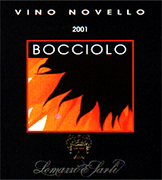 "RED WINE NOVELLO"- vins primeurs I.G.T. 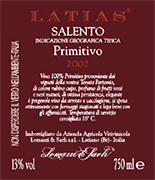 "Salento" Grapes: 60% Negroamaro - 40% Montepulciano. Best and unbroken bunches are chosen on the vine, then picked and gathered in boxes(20 kg each). After carried to the winery the grapes are introduced into hermetic inox tanks. Carbone dioxide is put instead of air so that carbonic maceration can take place in last 8 days. After pressing the must ferments in controlled temperature inox tanks. After fermentation the wine is bottled and ready to use. 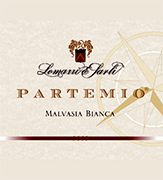 "WHITE WINE MALVASIA BIANCA" I.G.T. 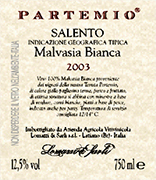 "Salento", grapes: white Malvasia of Brindisi 100%. 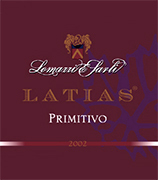 The grapes are picked and carried to the winery on small carts . 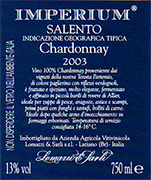 After crushing and stemming the product is introduced into a wine-making tanks where static settling takes place. The must is then racked and fermentation under controlled temperature is started. Alcohol 12,40 % vol. Total acidity 4,80 g/l Total sulphorous dioxide 70 mg/l pH 3,61 Party, Gastronomic combination: vegetable soups, white meat and fish dishes. 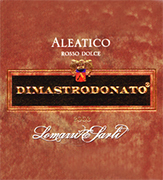 "RED WINE NEGROAMARO" D.O.C. 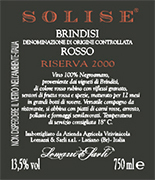 "Brindisi" Red wine, grapes Negroamaro 100%, The grapes are picked and carried to the winery on small carts. After crushing and stemming the product us introduced into a wine-making tanks for red wine fermentation which lasts 15-16 days under controlled temperature(26°). After racking, fermentation is completed in inox steel tanks of 150 hl. Alcohol 13,00 % vol. 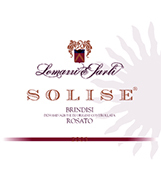 Total acidity 6,06 g/l Total sulphorous dioxide 70 mg/l pH 3,65. Suggested on red meat, poultry and cheese. 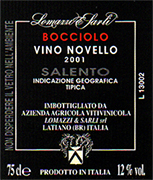 "SALENTO RED WINE NEGROAMARO" Negroamaro I.G.T. 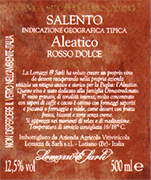 "Salento" Red wine Grapes: Negroamaro 100% Grapes are taken in wine-cellar by small cart. 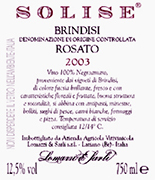 After pressing, the product is put in inox wine-container where it undergoes the fermentation in red wine for a period of 15-16 days to check of temperature, (25°C). Alchol 13,50% vol. 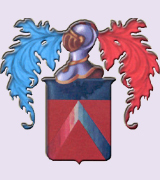 Dry soups, roasts of red meat, poultry, game, rich cheese and all regional food stuffs.